Nanodrugs phenomenal advances in nanotechnology and nanoscience have been accompanied by exciting progress in de novo design of nano sized drugs. Nanoparticles with their large space of structural amenability and excellent mechanical and electrical properties have become ideal candidates for high efficacy nanomedicines in both diagnostics and therapeutics. 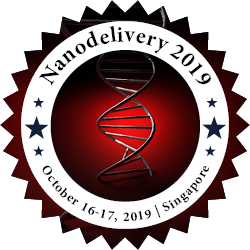 The therapeutic nanomedicines can be further categorized into nanoparticle drug delivery for conventional drugs and nanodrugs and nanobots with direct curing of target diseases. Here we review some of the recent advances in de novo design of nanodrugs, with an emphasis on the molecular level understanding of their interactions with biological systems including key proteins and cell membranes. We also include some of the latest advances in the development of nanocarriers with both passive and active targeting for completeness. These studies may shed light on a better understanding of the molecular mechanisms behind these nanodrugs , formulations of drugs , and also provide new insights and direction for the future design of nanomedicines. Personalizedmedicine aims to individualize chemotherapeutic interventions on the basis of ex vivo and in vivo information on patient- and disease-specific characteristics. By noninvasively visualizing how well image-guided nanomedicines-that is, submicrometer-sized drug delivery systems containing both drugs and imaging agents within a single formulation of drug, and designed to more specifically deliver drug molecules to pathologic sites-accumulate at the target site, patients likely to respond to nanomedicine-based therapeutic interventions may be preselected. In addition, by longitudinally monitoring how well patients respond to nanomedicine-based therapeutic interventions, drug doses and treatment protocols can be individualized and optimized during follow-up. Furthermore, noninvasive imaging information on the accumulation of nanomedicine formulations in potentially endangered healthy tissues may be used to exclude patients from further treatment. Consequently, combining noninvasive imaging with tumor-targeted drug delivery seems to hold significant potential for personalizing nanomedicine-based chemotherapy interventions, to achieve delivery of the right drug to the right location in the right patient at the right time. Drug delivery describes the method and approach to delivering drugs or pharmaceuticals and other xenobiotics to their site of action within an organism, with the goal of achieving a therapeutic outcome. Issues of pharmacodynamics and pharmacokinetics are important considerations for drug delivery. Designing and developing novel drug delivery systems, with a focus on their application to disease conditions. Preclinical and clinical data related to drug delivery systems. Drug Delivery and Translational Research is a journal published by CRS, providing a unique forum for scientific publication of high-quality research that is exclusively focused on Drug Development and translational aspects of drug delivery. Drug distribution, pharmacokinetics, clearance, with drug delivery systems as compared to traditional dosing to demonstrate beneficial outcomes. Short-term and long-term biocompatibility of drug delivery systems, host response. Biomaterials with growth factors for stem-cell differentiation in regenerative medicine and tissue engineering. Devices for drug delivery and drug/device combination products. Graphene is indeed a much-researched, heavily-hyped material, with the potential to revolutionize every aspect of our lives: from selective membranes that may solve the world’s water shortage, through replacing silicon in electronics to achieve amazing performance in miniature sizes, to enabling a multitude of next-gen energy solutions.Graphene’s compatibility with various biomedical applications, like drug delivery, cancer therapies and biosensing, is extensively and vigorously researched. The material’s unique properties, like a large surface area, good biocompatibility and chemical stability, deem it worthy of intensive examination and high hopes. The Novel Drug Delivery Systems are the method by which a drug is delivered can have a significant effect on its efficacy. Some drugs have an optimum concentration range within which maximum benefit is derived, and concentrations above or below this range can be toxic or produce no Local Drug Delivery Systems benefit at all. On the other hand, the very slow progress in the efficacy of the treatment of severe diseases, has suggested a growing need for a multidisciplinary approach to the delivery of therapeutics to targets in tissues. From this, new ideas on controlling the pharmacokinetics, pharmacodynamics, non-specific toxicity, immunogenicity, bio recognition, and efficacy of drugs were generated. These new strategies, often called drug delivery systems (DDS), are based on interdisciplinary approaches that combine polymer science, pharmaceutics, bio conjugate chemistry, and molecular biology. On the other hand, this reference discusses advances in the design, optimization, and adaptation of gene delivery systems for the treatment of cancer, cardiovascular, pulmonary, genetic, and infectious diseases, and considers assessment and review procedures involved in the development of gene-based pharmaceuticals. Tissue Engineering and Regenerative Medicine is appealing to scientists, physicians, and lay people alike: to heal tissue or organ defects that the current medical practice deems difficult or impossible to cure. Tissue engineering combines cells, engineering, and materials methods with suitable biochemical and physiochemical factors to improve or replace biologic functions. Regenerative medicine is a new branch of medicine that attempts to change the course of chronic disease, in many instances regenerating failing organ systems lost due to age, disease, damage, or congenital defects. The area is rapidly becoming one of the most promising treatment options for patients suffering from tissue failure. Regenerative Medicine and Tissue Engineering fairly reflects the state of the art of these two disciplines at this time as well as their therapeutic application. It covers numerous topics, such as stem cells, cell culture, polymer synthesis, novel biomaterials, drug delivery, therapeutics, and the creation of tissues and organs. The goal is to have this session serve as a reference for graduate students, post-docs, teachers, scientists and physicians, and as an explanatory analysis for executives in biotech and Nano pharmaceutical companies. Biopharmaceutics is defined as the study of factors influencing the rate and amount of drug that reaches the systemic circulation and the use of this information to optimise the therapeutic efficacy of the drug products. The process of movement of drug from its site of administration to the systemic circulation is called as absorption. The concentration of drug in plasma and hence the onset of action, and the intensity and duration of response depend upon the bioavailability of drug from its dosage form. Bioavailability is defined as the rate and extent (amount) of drug absorption. The Global Nano Pharmaceutical Industry report gives a comprehensive account of the Global Nano Pharmaceutical market. Details such as the size, key players, segmentation, SWOT analysis, most influential trends, and business environment of the market will be mentioned in this session.The session features an up-to-date data on key companies’ product details, revenue figures, and sales. Furthermore, the details also gives the Global Nano Pharmaceutical market revenue and its forecasts. The business model strategies of the key firms in the Nano Pharmaceutical market are also included. Key strengths, weaknesses, and threats shaping the leading players in the market have also been included. Nanotechnology, the science of very small materials, is poised to have a big impact in pharmaceutical packaging. Basic categories of nanotechnology applications and functionalities appear in development of pharmaceutical Packaging(or pharma) in terms of enhancement of plastic materials’ barriers; incorporation of active components that can deliver functional attributes beyond those of conventional active packaging and sensing and signaling of relevant information.